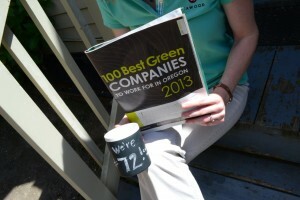 100 Best Green Companies In Oregon: We’re No. 72! Posted June 17th, 2013 & filed under Sustainability. In a post last month, we mentioned we’d been selected as one of Oregon Business magazine’s 100 Best Green Companies to Work For. Well, since then we found out how we ranked: No. 72, baby! Who else can say that? That’s right. Nobody. Posted July 22nd, 2011 & filed under Advertising, Sustainability, Tips of the Trade. CAWOOD’s blog has random, thoughtful comments. Check it out for our take on sustainability, tips, the digital world, marketing and life in general. Our goal is to challenge or inspire. Are you ready? Posted May 6th, 2010 & filed under Sustainability. Recently, Eugene Rotary issued Business Sustainability, in Practice, a report that provides a basic how-to for companies to implement sustainable practices designed to improve their businesses and their bottom lines. Our president, Liz Cawood, was active on the committee that created the report. It’s a great tool. Posted January 29th, 2009 & filed under Book Reviews, Social Media, Sustainability, Web. The subtitle of the book is what it’s all about: How to Transform Your Company. This short, 128-page book captures the essence of modern business thought: Peter M. Senge, Stephen R. Covey, Mihaly Csikszentmihalyi, George Ainsworth, John P Kotter, and Everett M. Rogers. Wow! It shows how applicable all those thought leaders are to moving sustainability forward. Posted January 29th, 2009 & filed under Book Reviews, Sustainability, Web. Subtitled An Alphabet for Living, this small – but information rich – book organizes hundreds of web sites that help you become sustainable. Sometimes you’ll find a tidbit of useful advise. Some of the more interesting headings = transportation, formal dresses, coffee, golf, plastics and alternatives. You’ll put this next to your computer and refer to it often. Sustainability awaits! Posted January 26th, 2009 & filed under Office, Sustainability. As part of a new client initiative, we’re sending out a series of postcards this year. Wanting to be sustainable, we used uncoated recycled paper for the first one. If you received one, you know how bad they looked. The paper peeled, they were bent, and the vibrant color just disappeared.